Primary Residence: Currently back in Thailand attempting “Greed”. How did you start climbing? My parents gave me a 3 month membership to the local gym for my 15th birthday. I then lived there until I finished high-school (I climbed 15 days on, 1 day off for 4 years!) and the day I wrote my last exam I moved into my car and lived on the road for 7 years. 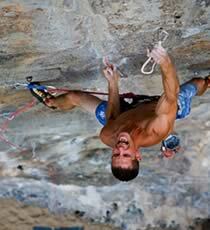 What’s your favorite type of climbing? Well, I am most passionate about sport climbing. I love clipping bolts and although I also enjoy trad climbing and bouldering, sport climbing will always be my #1 passion. With trad climbing I only really like doing hard 5 star lines, I’m not so much into just “craggin” and doing millage on moderate trad routes. I also get off on Head-pointing scary trad routes, although I don’t focus on it, I do enjoy the occasional scary challenge. Last fall I went to England and repeated an E10 route my friend Tim Emmett put up. It was brilliant and one of the most memorable trips of my life, but I wouldn’t want to climb routes like that every day. I also just went on my first “Bouldering Trip” ever! We went to Hueco Tanks for 2 weeks. It was fun, but I definitely I like sport climbing better. Maybe because I’m better at it but also because I don’t like hitting the ground when I fall! I’d rather take a 100 footer on an 8.9mm BW cord over a 4 foot fall onto 6 pads and 4 spotters any day of the week! Bouldering is scary! What’s all this about you working at a Gold Mine in the Yukon? Yeah, it’s really cool. We’re 3 hours South of the Arctic Circle (it never gets dark this time of year!). Some friends of mine and I started this company last year so we’re past our 3rd year now. My job is to drive a 40 ton rock truck 12 hours a day for 120 days in a row! Some days we work for 15 or 16 hours! I spent my entire 20’s just traveling and climbing pretty much full-time non-stop. So now I’d like to try and get ahead a bit so I can get started on another dream of mine and make it a reality as soon as possible. What’s that? like… Do you want to buy a house or something? Well, not quite a house… I want to buy my own airplane and fly myself around the world, hitting every continent and climbing in as many places as possible. I have done a LOT of research into it and spoken to many people who’ve flown around the world (their called “Earthrounders”), and I was really happy to learn that most of them are not rich. It doesn’t cost nearly as much as most people would think. This one guy I know spent 10 years flying around the world [he just got home!]. He went to over 150 countries and landed in over 1,500 places! He did it all with a 1969 Cessna 182 with no GPS and no Auto-pilot! Running the thing 1/2 the time on car gas because the places he went didn’t sell AvGas (that’s fuel for planes). The planes i’m looking at [to buy] cost less than most people’s vans! It’s like the ultimate climber bum life style, but you’re traveling in style! I’m hoping I can buy one in the next year and start prepping for the trip so I can leave in 2 years. The whole trip will take at least 2 or 3 years to do. What about a career? By then you’ll be in your mid 30’s! Don’t you ever want a “real job”? Yeah, but I’ll also have flown solo around the world in my own plane! That’s just so cool! And it is helping my resume so much! I might write a book about the experience and then I will probably go back to working as a pilot when the whole thing is over. You must know how to fly already? Have you worked as a pilot before? Yes, I started flying when I was 25 and I worked for a few years as a flight instructor in Vancouver and Squamish and I did Charters and Tours on the West Coast of BC. I also fly float planes (planes that land on the water). I think in the future I will end up going back to being a float plane pilot for life! Airline jobs are boring; Float planes are fun (and the work is often seasonal so I can climb for 1/2 the year!). I actually just turned down a good flying job on a float plane this summer in order to come here to the Yukon. Gold Mining isn’t as much fun as flying floats (it almost is! ), but the pay is much better, and the season is very short. Other passions: I like making videos but I’m not very good at it, I just use iMovie on my Mac, and I enjoy taking photos (but I’m not very good at that either). Obviously Flying airplanes. I also really like Yoga but I haven’t been practicing since I got to the Yukon. I also just got into Skydiving. I have all my own gear and I’ve done about 65 jumps so far (I learned in France when I was climbing in Ceuse 2 summers ago. I would go to the airport and skydive ever morning and then go climb all afternoon!). I am back in Thailand to finish a project there that I almost sent last winter (I fell after the last bolt because I cut my finger). I Love Dynos and I felt like I could do that route if I went back a little stronger. I actually found all the Dyno’s on the route not very hard; for me the hard part was the bottom half before the dyno’s! I’d also like to continue Skydiving and get up to 250 jumps so I can start BASE Jumping. I was thinking if I get my plane by next summer and I come back and work here again, I might teach one of the guys here how to fly (I am a flight instructor so I can legally teach them) and then after work we could go skydiving every day! The guys here already said if I buy a plane we’ll build a landing strip right here next summer! How sweet would that be?! Yeah: Tie a knot in the end of your rope! Even if you think it’s long enough. it’s just a good habit to get into. Spread the word.